Age: Young adult, "late teens", typical Avalon clan age. Personality: Quiet, brooding, sullen, standoffish, easily annoyed, awkward, kind of pathetic but at the same time he's strong and caring. He's very expressive, an adaptation of being born mute. His hearing, sight, smell and speed are a little more honed than the average gargoyle since he felt he had to prove himself when he had no voice. He's rather withdrawn and likes to keep to himself. He likes reading, drawing and music. 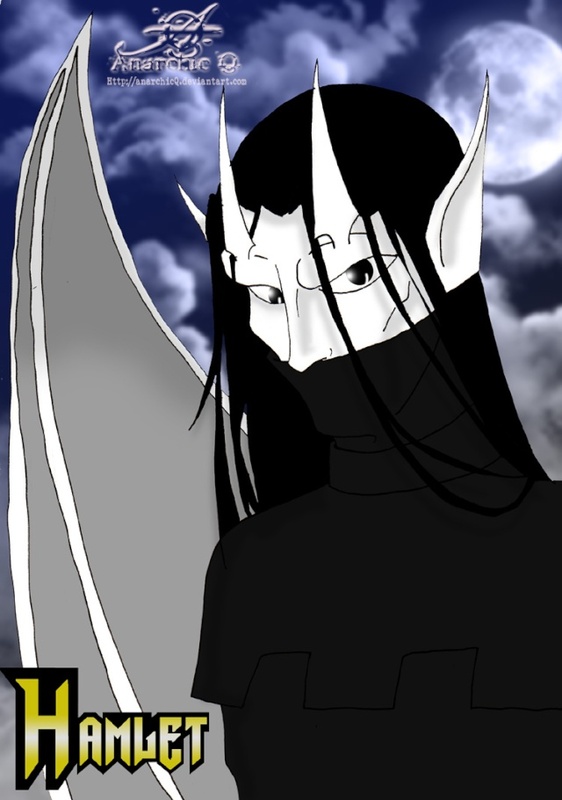 Description: A white gargoyle, his bat wings have grey membranes. His brow ridges have long almost dagger-like horns pointing from them. His elbows and knees also have these horns. The end of his tail is spaded. He wears a black tunic, and black cuffs with fingerless gloves. The collar of his tunic is pulled up and covers the bottom half of his face. His hair is long, about half-way down his back, black and kind of limp and lifeless. His eyes are black, but they glow yellow-white when angered. History: Hamlet was one of the eggs that Princess Kathrine took from Castle Wyvern after the viking attack. His egg was slightly damaged on the trip to Avalon and as such his vocal cords did not form correctly, rendering him permanently mute. Different from the others, Hamlet always felt a little ostracized but it was mostly his own doing. He simply felt awkward around others and so kept to himself for the most part. As he grew older he began to have feelings for Ophelia but again, he felt inadequate and so pined from afar. Goliath came, Goliath and Angela went, and gradually Ophelia found herself in the loving arms of Gabriel. Hamlet knew he could not compete with the warrior and so now he just wants to know "where he needs to be". That was it. He lost. He watched as Gabriel and Ophelia glided among the clouds together. It made his ears droop, and his heart sink. Hamlet was perched on a cliff, and he turned his eyes away from the two lovers, to the rocky waves below. He could jump. It would only hurt for a second. Even better, he could stand on the very precipice, wait for sunrise, turn to stone, and become so top-heavy that the ground would give way and he'd fall and shatter into a million pieces. There's be no pain that way, and no coming back from it. He rolled his eyes. "What are you thinking?" He mentally chided himself. "That's pathetic, even for you. Just be happy for her and let it go." Perhaps Goliath would have him. Not that any other girl would want him anyway. You might want to NPC telling Princess Catherine and the Guardian that you are leaving. For Now NPC the Swimmer getting into the Boat with you. She should have her bio up soon. She has it up. I was going to contact her about us actually RPing that. Yup. I found it. I approved her.